I found two similar questions, but both for Note 9, and none of the suggested solutions worked for me. I've never seen that before, it appears to be "chat" instead of mms? Not sure if I got this right, but I've never heard of the "chat" functionality, and if it is somehow turned on for these two group texts, then could you tell me how to turn it off, without losing any of my messages? This started happening after the latest update from T-Mobile, before that it all worked fine. Also, as someone suggested, I turned off "Send read receipt" and "Share typing indications" in Chat Settings, but that didn't help. Also cleared Messages cache, didn't work. But now whenever I click into any conversation it asks me if I want to turn on the Send read receipt. How do I disable that popup? Is there something like "don't ask me again"? 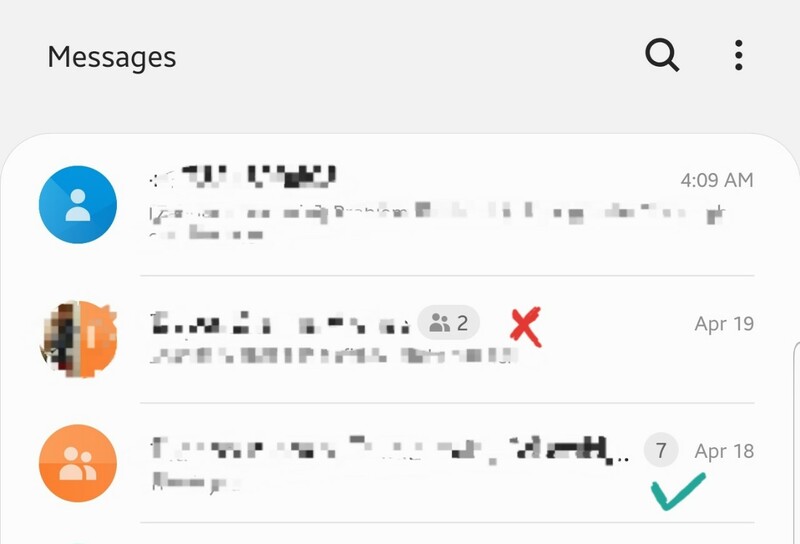 Hmm, do you get an error message when you send to the numbers in group chat? Or, does the message not show up on their end? I'm also curious if this other numbers are with T-Mobile or another carrier? I do not get error message when I send to the numbers. I have several group chats. Only two of them are messed up, i.e. have that icon I've never seen before, and I immediately get an error when I try to send a message. I can receive messages just fine. I don't think it has anything to do with the other person's carrier, since I have different group messages with the same people and those work fine. I ended up calling T-Mobile and they opened a ticket for this issue. They said it's probably related to network, but I'm not convinced that's true, because my other group messages with some of the same people work fine. Also, I still didn't get an explanation for that weird new icon - I'm convinced there's something there. Thanks for that info. I'm wondering if this has something to do with the Advanced Messaging feature in the pre-installed app. Can you switch to 2G and test out a new group message to see if that goes through? Please let me know what the results were after testing on 2G only. Thanks!